Getting a new pillow shouldn’t be that difficult…after all, it’s only a pillow. Waking up night after night with a sore neck and some headaches (to say the least) says the opposite though and the sooner you realize that no pillow is just a pillow (unless you’re some “special” customer that doesn’t use a pillow at all), the better for you and your sleep. The market gives us all sorts of pillows and we’re not talking only about the shapes and sizes, but also about the filling, which is kind of essential, you know. If you like fluffy and cloud feel on a pillow, you should definitely try a down pillow or even a feather one (as long as you get the high quality type so there’s no chance for poking from the feathers). Of course, every now and then, you need to fluff the pillow (and pay the extra buck), but it’s totally worth the effort. You may also try buckwheat pillows, memory foam pillows or shredded memory foam pillows. Each type comes with ups and downs and comfort should trump everything. 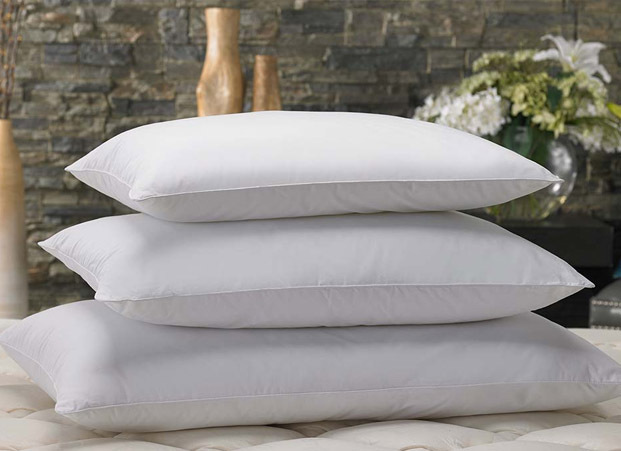 The down alternative pillows are filled with synthetic material (polyester fibers falls in the category), which may explain the lower price. The filling may be also cotton or tweed. Taking care of a down alternative pillow isn’t that difficult and you may use the washing machine, along with your bedding. Sure, they may not be as fluffy as down pillows, but some people do find them pretty cozy (comfort it’s a matter of taste in the end). Let’s not to mention the flat part as the down alternative may lose their shape (get flat) sooner than down pillows (a fast fluffing works only for the down pillows, though). This type of pillow is comfortable and offers a nice support for your head and neck. It’s firmer than a down pillow, which explains the better support for the head and neck. It’s a more structured pillow and that’s because of the thicker material used for the filling. The alternative down pillows do make it as a great, healthy option for the allergic customer as they don’t contain any down-, which “wakes” up your allergies. So, if you still on the fence about the matter, get down already and try it for yourself. After all, you’re not losing that much! The best part about the down alternative pillows is that they can be pretty dependable for a very low price. It’s the case of the Premium Super Plush Fiber Filled Pillows that manages to be firm enough to offer a pleasant comfort for your sleep. The pillow is presents 1000G fiber, which explains the comfort, no matter what’s your sleep position. 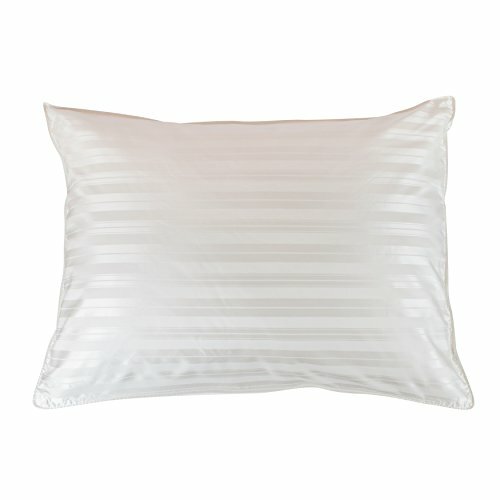 Firm, yet fluffy enough, the pillow provides good support for your head and neck throughout the entire night. Not only the pillow is free of allergens and chemicals, but also comes with an anti-microbial finish, which minimizes risk for the microbes to grow. That’s why the pillow is a choice to consider by any allergic customer. The pillow comes compressed packed and it fully expands in a couple of hours. We also like how the pillow looks like as it’s tailored with 240Thread count cotton fabric that ensures double-needled corded edges. The professional finish with high thread count increases your comfort, as the pillow feels soft against the skin. Additionally, the pillow is more durable and takes the intense use. The pillow is efficient also because it comforts any pressure points, helping you sleep better. It doesn’t get hot in the summer and you do wake up dry and fresh every morning. The pillow looks well made and does not smush down too much in your sleep. You may easily machine wash it on the gentle cycle with cold water. You may either sun dry it or tumble dry on low, for expanding its life span. Nevertheless, for the buck you pay, we’d say you end up with a pretty dependable down alternative pillow that is comfortable and looks also nice. If you’re looking for a set of sham pillows that look nice and give your bedroom a nice, cozy feeling, a low budget option is the Set of Two Hypoallergenic Microfiber Pillows. The 2 pillows are made with polyester fiberfill and manage to be nice and fluffy for quite some time. They only need a couple of hours until they fully expand, but it’s totally worth the wait. The pillow present a standard firmness and hold their shape for more than just a couple of weeks. The microfiber cover increases the comfort and helps the pillows to be rather cooling in the summer and warm in the cold winter. Even though most of the customers used them more as sham pillows and not that much for sleeping, the pillows do make a fair option for the back and side sleepers. The hypoallergenic filling puts under control the allergies so the pillow are safe to use by anyone struggling some allergies. As for the cleaning, no worries either. The pillows are both machine washable and dryable. We like the pillows as they work just fine as sham pillows for a guest room or any other room. They are lightweight, soft, yet firm enough to offer decent support for your head and neck when used for casual sleeping. 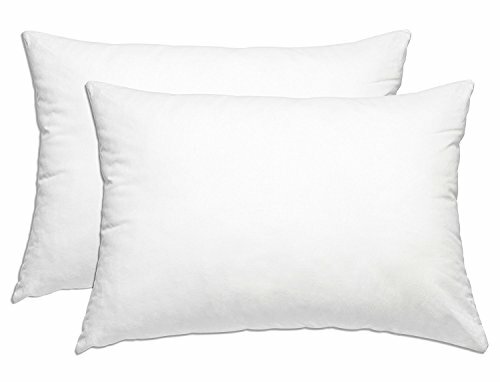 Despite the minor issues, for the little money you pay, you get pretty reliable down alternative pillows that work better as sham pillows, but may be used for sleep from time to time. We all know by now that down alternative pillows aren’t that expensive which may explain the popularity of our first choice. The Smart Home Bedding Super Plush Pillow isn’t just cheap, but it’s also comfortable and efficient for a good amount of time. You get in fact a pack with 2 standard sized pillows. They work for all sleep positions and are medium firm. 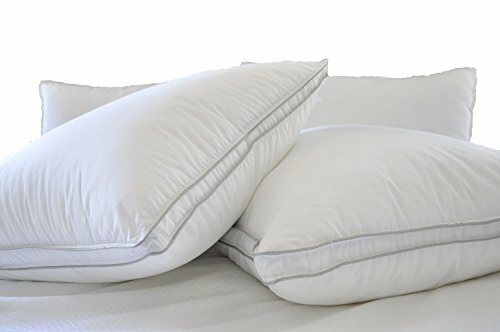 The pillows present a poly cotton shell and the filling is a luxurious fiberfill. Therefore, the pillows are able to provide good, firm support for your neck and head, which is essential for a good sleep. The cover is made with a nice looking poly mercerized cotton, which also has a nice soft touch feel. The filling makes the pillows a safe choice for the allergic customer also, as they don’t bring up any allergies. As for cleaning, you may easily toss them in the washing machine from time to time, in the gentle cycle with cold water. For expanding the life span, it’s better to sundry them or tumble dry on low when in need. The pillows come to you well compressed packed so you do need to give them some hours to fully expand. They have no smell whatsoever. 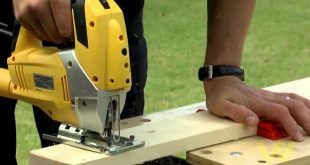 They’re made here in the USA and this may seal the deal for some. Nevertheless, for the money you pay, you get pretty nice, comfortable and supportive down alternative pillows that work for quite some time. When we talk about these next pillows we kind of sit on the fence, as their main feature may be the main flaw at the same time. We like a lot the Hotel Luxury Reserve Collection Bed Pillow as they are so fluffy and puffy, but, at the same time, some may find this quality to be overbearing for their comfort (which is always kind of a matter of taste, sort to say). The pillows are big and fluffy and your head sinks into them, but not too much, though. They offer good support and are firm, despite being quite soft. 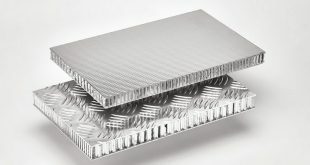 They are filled with premium down alternative so they bring to the table the typical features of this type of filling. They keep at distance any allergens, becoming a wise choice for the customer that is prone to allergic reactions. The cover is made with 500-thread count, 100% Egyptian cotton. This doesn’t mean just a nice, soft touch feel, but also durability for the pillows. They hold up the intense use and the risk for tear and wear out isn’t high. The pillows are well made and are in for the long run, without losing their shape. The stitching looks good all over the pillows. We also like the pillows, as they don’t have any chemical smell. The material is high quality and so it the manufacturing. The pillows are comfortable, no matter how you sleep and give a luxurious, hotel like feel when you’re sleeping. In order to help them last longer, you should only wash cold them on gentle cycle, with like colors. Use a non-chlorine bleach when necessary and do run the spin cycle twice for better results. Tumble dry them on low heat and fluff them when completely dried. Never iron them. All things considered, we still like the pillows for their fluffy, yet good support and the nice, soft touch feel that lasts for quite some time. Try a silky feel with the Soft Density – Silk Pillow Down Alternative Luxuriously Microfiber Bedding Pillow. The pillow is a medium density Queen pillow filled with 100% plush microfiber. 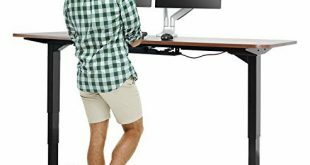 It’s not only very comfortable and supportive, but also hypoallergenic and resistant to dust-mites. We like the pillow for many things and we need to pinpoint the breathability and the comfort it brings to the table. The pillow is designed for impressive support for your head, neck and shoulders. Unlike many other alternative down pillows, this one maintains its shape for a good amount of time. Its elegant jacquard print presents a sophisticated finish and the pillow impresses also with its appearance. 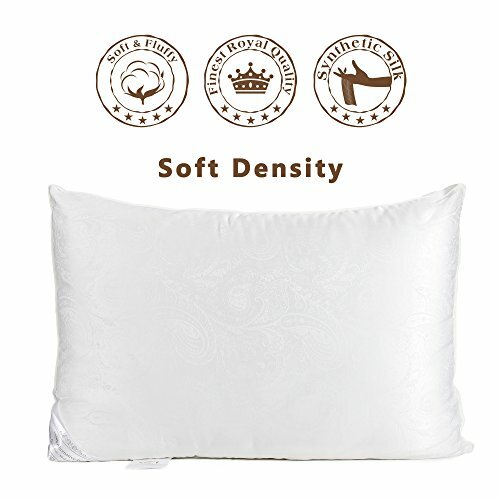 We like the soft touch feel of the pillow and the great balance between the softness and firmness. It presents just the right amount of loft, for best comfort for all sleep positions. The pillow presents a good build and takes the intense use. It’s made with soft silk polyester and has a 300-thread construction, feeling great, without sacrificing the comfort or shape. Don’t forget it’s hypoallergenic so it’s a safe choice for the allergy sufferers. As for the cleaning, you may definitely machine wash it on a cold and gentle cycle, letting out for drying. Despite the cons, for the comfort, quality and nice appearance, the pillow is worth every single penny you pay. Fluffy and thick, the Gusseted Quilted Pillow (King, 2-Pack) – Hypo Allergenic and Easy Care are a dependable option not only for the allergic customer, but also for anyone looking for an affordable and comfortable choice. The pack consists of two pillows and each pillow features blue piping and double stitching. The pillows have an exquisite appearance and leave a durability feel. The pillows present a 950GSM fiber filling and are medium firm. This makes them a good option for any sleep position, including the combination sleep position. They are medium firm, so they manage to offer a firm support, even though they do feel fluffy. They are 100% free of any chemical substances so they are safe to use by all, especially the customers fighting some allergies. The breathability of the pillows is another good feature that is worth mentioning. The pillow are easy to mold so you may shape them the way you want, for best comfort. This doesn’t mean though the pillows lose their shape over night. By all means, they hold their shape for quite some time. The pillows don’t have a smell and the beginning and may need more than a day to fully expand. If you don’t see any results after 2 days, you may try the 2 tennis-ball trick (place the pillow in the dryer with 2 tennis balls and tumble dry low for an hour to get the fluffy effect on the pillow). You may expand the life span of the pillows by letting them dry in the sun a couple of hours daily so that the moisture built throughout the night evaporates efficiently. You may machine wash the pillows, but you could play it on the safe side and only dry-clean them when in need. The pillows come in both queen and king size so it’s up to you to decide which size works the best for you. Despite the minor issues, the pillows are worth to try especially because they are dependable and nice looking at the same time. 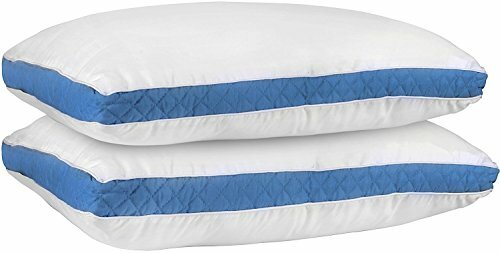 Made in our USA, the Perfect Fit Firm Density King Size 233 Thread-Count Quilted Sidewall Pillow 2 Pack are worth to try when you want a good night sleep, without bringing out your allergies. 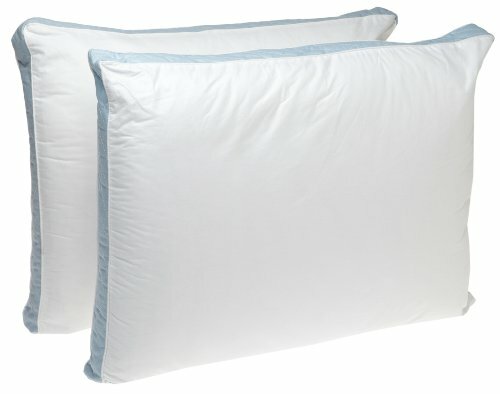 The pillows are filled with 32 inches of soft 100% Slumber soft polyester fiberfill. The pillows have a lofty feel and offer a good support for your head and neck throughout the whole night. Taking a look at the manufacturing, we notice the 1.5 gusseted-quilted sidewall, which makes the pillows a better choice for the back sleepers. The corded edge is thoroughly reinforced, giving a more durable pillow. 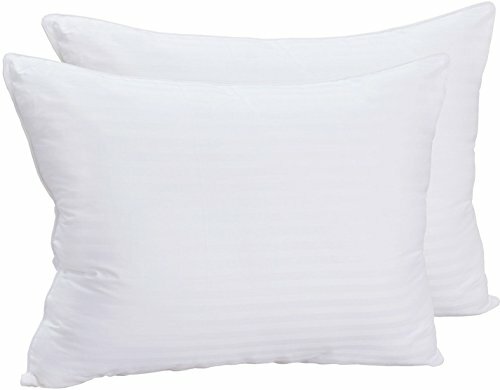 The pillows come with a 233 thread-count cotton cover that feels nice and soft against the sink and are very breathable. You wake up dry and fresh each morning, as the pillow doesn’t retain moisture. Thick and supportive, the pillows work for all sleep positions. They give proper spinal align and comfort your shoulders, neck and back. As the pillows come in different levels of firmness, you may decide on your own which type works for you, depending on your favorite sleep position. If you are struggling some allergies, it’s essential to know the pillows work for you as well as they are hypoallergenic. They have no chemical smell whatsoever either. No fuss when it comes to cleaning them either; the pillows are machine washable. We do realize the pillows come with some flaws but they are still good option to try. Try a luxurious feel when you sleep with the Natural Comfort ALLERGY SHIELDS Luxurious Down Alternative Pillows. In order to understand where is that feeling coming from, take a better look at the composition of the pillows. They feel soft against the skin as the shell is made with 300TC cotton. Add to that the filling which is 100% microfiber clusters and you have a clearer explanation for the nice comfort you get when using the pillows. The shell isn’t just nice to touch, but also breathable, so you wake up fresh and cool every morning. The cotton is anti-microbial and keeps at distance dust mites, pollen, mildew, and bacteria as well. The pillows become this way a safe choice for the allergic customer as they prevent and alleviate any symptoms of asthma, sinusitis or nasal allergy. You can choose from various levels of firmness so it’s impossible not to find the right pillow for you. The pillows are well made and have a durable feel. They are comfortable, supportive and impress with the size. 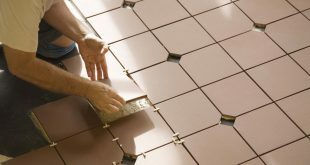 They are easy to mold and very easy to sleep on. There’s no smell on the pillows, not even in the beginning. They are easy to clean, as they are machine washable. We try to focus on the positive as the pillows bring more good things than bad ones and, who doesn’t want a luxurious, allergen-free, sleep every night? You don’t need to pay the big bucks to try the down pillow as an alternative down pillow like our next choice will do just as well. The Faux Down Pillow gives the comfort of down fill, without having to pay that much. The pillow is filled with fine microfiber gel clusters so it cradles nicely your head, without sinking it though. The pillow is plush and alleviates all sorts of pains in the back, neck or shoulders. It’s a good choice if you’re dealing with fibromyalgia as well. Soft, yet supportive, cozy, yet not to bouncy, the pillow is also a healthy choice for anyone with allergy issues. 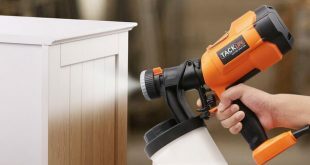 It’s naturally hypoallergenic and irritant free, keeping at distance dust mite, bacteria and all sorts of microbes. We like the pillow as it molds easy for a good support for your head and neck. It gives them the right alignment as well. The pillow comes with two covers that add not only durability, but also better protection against dust mites and microbes. The inner cover is hand sewn with 500TC white cotton and the double needle stitching is reinforced for more strength. The outer cover is made with cotton and poly (80/20) and it’s removable for washing. It’s also hypoallergenic and has an amazing soft touch feel. Easy to use and to wash, the pillow works for any sleep position. It has a good shape and the embroidered logo on the velour cover really looks nice. All things considered, for the luxurious feel and nice looks, the pillow still stands as a dependable choice when in need. For those of you who are willing to chip in when it comes to their comfort, an amazing option is the Austin Horn Classics DuPont Sorona Down Alternative Sleeping Pillow. “High quality” is writing all over the pillow and you can see it from the very beginning. The cover is made with 60% and 40% cotton, which explains a lot the soft touch silky feel the pillow has. 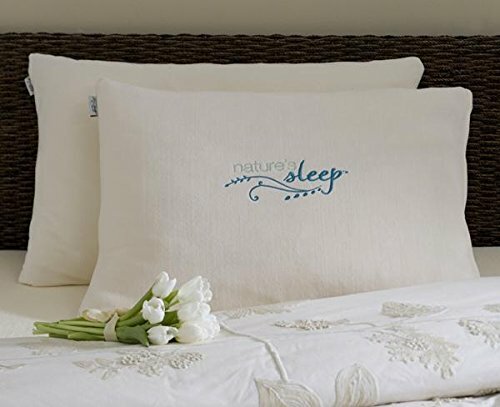 The 500-thread count and the 100% sateen cotton fabric give an exquisite pillow and the 1-inch gusset and matching color self-welt increase the value of the pillow. The stripe protector cover feels nice against the skin and is both removable and zippered. You may machine-wash it for a fresher feeling from time to time. The Elite down alternative pillow is filled with Sorona fiber mixed with pearl fiber, so you get it why it feels so comfortable, no matter how you like to sleep. For those of you that price highly the environment, it’s important to mention that Sorona fiber comes in part from annually renewable plant based ingredients (corn specifically). The pillow has a small carbon footprint, unlike many polyester down alternative pillows out there. The list of features is impressive and the pillow presents efficient breathability, absorbing moisture over night. It keeps control over the temperature around your head and remains bouncy for a long time. It’s static free and includes no chemical additives, helping the natural ingredients to perform better. The pillow and its cover are machine washable, but it’s better to play it on the safe side and use gentle cycle only, with similar colors. You should use non-chlorine bleach when in need and only tumble dry-low temperature. Comfortable, squishy, yet so supportive, the pillow is a great investment for your sleep and health. If you ask us, we’d still buy again the pillow for its comfort, feel and looks, even though the wallet doesn’t agree.